Many CairoBookStop readers have expressed interest in a forum where they can interact with one another directly. Others have asked where to find local literary events or if they might post information about their events on our site. To help meet both of these needs, we’ve created a Facebook page: Cairo Book Stop / محطة كتب القاهرة. Currently CairoBookStop’s Facebook page is open to posts from everyone to help keep it as relevant and up-to-date as possible. Publishing houses, bookstores, and cultural centers in Cairo are welcome and encouraged to post information about their own upcoming events. CairoBookStop, too, will post news that may be of interest to our readers but lies outside of the scope of our website itself. If we find the page needs more moderation, we’ll step in as needed. We reserve the right to remove any content that is inappropriate, offensive, or off-topic. We hope you’ll check out our new page! As always, feedback is welcome. Thank you for your patience over the past few weeks as we sorted through and worked to address the many emails, comments, and suggestions that have come in. Though we’ve been quiet in terms of posting, we’ve been busy behind the scenes. In case you missed it, CairoBookStop has been getting some attention: Publishing Perspectives’ Olivia Snaije recently wrote a piece on CairoBookStop, and M. Lynx Qualey conducted an interview with us about the site on her blog Arabic Literature (in English). Thank you to all of our readers who contacted us with suggestions for how to incorporate libraries and with other resources on this front. We’ll continue to look into the viability of adding these to our site. As for forums, look for an update in the coming weeks about how we’ll be making use of the forum format for our readers. Thank you to everyone who has visited our site! We are grateful for all of the positive and helpful feedback we have received in the form of clicks, likes, follows, submissions of possible additions, and emails with comments, resources, and suggestions. The initial influx of feedback and suggestions has been just what we were hoping for and very much in the spirit of this web-project. Through this kind of collaboration, we hope to expand CairoBookStop and make it a valuable resource. We are working hard to address all of your comments, and will use this section to keep you informed of what we’re working on and what to look for next on CairoBookStop. For each new publishing house/ bookstore that we add, we’ll start by putting it on the map and providing the basic information. For those houses and stores we interview or can provide more information about, we’ll later add a description to their individual pages. In this way we hope to keep the site as up-to-date and helpful as possible, while ensuring accuracy of information. Libraries! We’ve had several suggestions/ requests to add libraries to CairoBookStop. We think this is a good suggestion and are looking into the logistics of making this happen. If anyone has suggestions about where to track down a listing of libraries in Cairo or any resources on how the library system works, we’d be grateful for the tips. 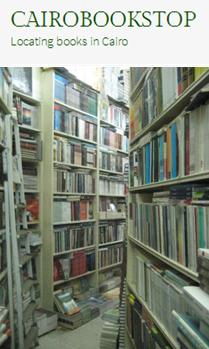 You may contact us at: cairobookstop [at] gmail [dot] com. A forum for readers, publishers, booksellers: This would be a forum page on our site for readers, publishers, and booksellers to interact directly and would be especially helpful, we hope, for readers to track down specific titles.